Today, as in the past, communities of Catholic sisters are doing inspiring work to make a difference in the world, yet it too often goes unnoticed. Thanks to a $900,000 grant from the Conrad N. Hilton Foundation, that may be about to change. The Hilton Foundation awarded the grant, Communicating Charism: Educating for Leadership and Social Media Capacity in Communities of Women Religious, to the Loyola University New Orleans Institute for Ministry. The Loyola Institute for Ministry will use the grant to help Catholic sisters in the U.S. and Africa enhance leadership skills, build social media capacity, and thereby increase membership. The funds also will provide computers, internet access, and solar power to some of the communities in Africa. "Communities of women religious have such vital charisms and do such important work around the world," said Thomas Ryan, Ph.D., director of the Loyola Institute for Ministry and the director of the project. "This grant is meant to empower women religious to make effective use of digital media to get the word out about their work and its transformative potential for faith and life today." Four religious communities in the U.S. and three in Africa will benefit from the grant, which will provide members and their associates graduate-level education through Loyola, especially its online program, integrating leadership, theology and communication. While earning the Certificate in Theology and Ministry from the Loyola Institute for Ministry, participating communities will work with Salt + Light TV of Canada to develop high quality videos and social media strategies to help promote their work. Barbara Fleischer, associate professor of pastoral studies emerita, and the associate director of the project, said the grant also will help make Loyola Institute for Ministry programs more widely accessible. "We're delighted to receive this grant to be of service to communities of religious," Fleischer said. "We're excited that it will expand our online master's program to three other countries. It's already available in Nigeria. This will extend it to Tanzania, Uganda and Kenya. It also will provide improved electricity and Internet connections to those communities needing them." 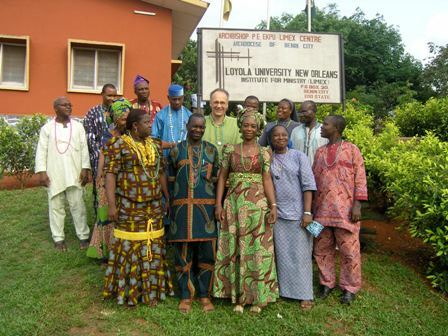 Loyola Institute for Ministry alumna Sr. Cecilia O. Dimaku, SSH, MPS ’07, who was instrumental in getting the LIM program off the ground in Nigeria, is excited about the potential of the new grant. “The threefold advantage of bringing together the rich traditions and charisms of the participating congregations, the training of the sisters in pastoral leadership and communication, and sharing of the story and charism of these different congregations, from different parts of the world, through a documentary video is most awesome. What a wonderful way to be witnesses to our world and to respond to Pope Francis’ ‘Wake up the World’ call. Thank you to Loyola University for conceiving this project. Thank you to the Conrad N. Hilton Foundation for making it a dream come true,” Dimaku said. The Hilton Foundation is the legacy of late hotelier and businessman Conrad Hilton. The Foundation's grant making programs regularly fund several priorities, including strengthening communities of Catholic sisters in order to advance human development more widely and effectively. For more information or to schedule an interview, contact James Shields in the Office of Public Affairs at 504-861-5888. The Loyola Institute for Ministry offers graduate degrees and certificates that are theological, practical, and take seriously the hopes and experience that adults bring to their studies. LIM has a broad vision of ministry, which holds that it is practiced in explicitly ecclesial contexts—in churches, schools and dioceses—and beyond wherever people of faith live and work. Students are encouraged not simply to analyze the world as it is but also to imagine—through prayer and in conversation with classmates, instructors, assignments, and research—the world as it can be, and to lead others in creating a more just and humane society. Students have several ways or participating in LIM—on-campus, online, or in extension in learning groups in locations around the United States (including at the Louisiana State Penitentiary at Angola), as well as in Scotland, England, and Nigeria. For more information, please see www.lim.loyno.edu. The Conrad N. Hilton Foundation was created in 1944 by international business pioneer Conrad N. Hilton, who founded Hilton Hotels and left his fortune to help the world's disadvantaged and vulnerable people. The Foundation currently conducts strategic initiatives in six priority areas: providing safe water, ending chronic homelessness, preventing substance abuse, helping children affected by HIV and AIDS, supporting transition-age youth in foster care, and extending Conrad Hilton's support for the work of Catholic Sisters. In addition, following selection by an independent international jury, the Foundation annually awards the $1.5 million Conrad N. Hilton Humanitarian Prize to a nonprofit organization doing extraordinary work to reduce human suffering. From its inception, the Foundation has awarded more than $1 billion in grants, distributing $92 million in the U.S. and around the world in 2013. The Foundation's current assets are approximately $2.4 billion. For more information, please visit www.hiltonfoundation.org.